Students got their first look at the newly renovated Crosland Tower at the beginning of the semester, and while the face lift certainly improved the space’s aesthetics, its practicality was met with a lukewarm response. 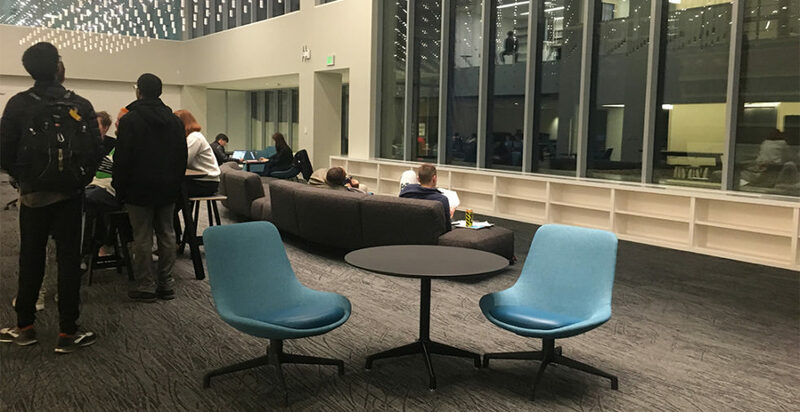 The seven-story study space dramatically increased the amount of student seating, but this was at the expense of individual, cubicle-style spaces. Large multi-seat tables fill the tower, giving the library a more collaborative feel. This doesn’t stop students from working individually at a shared table, so this complaint is minor. Most of these tables share an unfortunate trait: backless chairs. Between the stools and picnic-style benches, it seems that the seating was not designed with ergonomics in mind. Given the inevitability of hours-long study sessions, this may be an example of Tech emphasizing form over function. In fact, this emphasis seems to permeate every aspect of the new library. The focus on natural lighting is great, but it leads to a dark study space at night. The open concept layout of several floors gives the space a modern feel, but it leaves a lot of seating out of range of wall outlets. The wall of empty cubbies on the ground floor would look great if they were full of books, but the space could have been better used as more study space or seating. This could easily change, especially considering the fact that the library is still a work in progress. But given our status as a leader in innovation, it would have been nice to see a bit more functional innovating with the renovation. These gripes do not change the fact that, in all, the new tower is a fantastic upgrade. The energy usage was greatly reduced, and the variety of breakout rooms and collaboration spaces will bring a lot of flexibility and take some pressure off of the Clough rooms. The sheer beauty of the space also cannot be overstated, and the focus on aesthetics helps create a good atmosphere for working. The design was tailored to directly address student issues with the old tower, and in that sense it succeeded. Aside from the functional issues of chairs and outlets, most student complaints will subside once they get used to the building. It is true that there are very few books, but there is no doubt that this reflects a low checkout rate. At the end of the day, Crosland Tower stands out as one of the most impressive spaces on campus, and if Tech refines their approach on future projects we can have both beauty and function.